Inside the Docebo platform, users can be categorized based on groups, or by branches of the organization chart. Groups are useful whenever there is a set of users with characteristics that are different than those determining the branches of the organization chart. Groups can be assigned directly to courses and learning plans. To create a new group, log into the platform as the Superadmin. Then, access the Admin Menu by scrolling your mouse over the gears icon in the left sidebar. In the Admin Menu, press the Groups item in the E-Learning section. On the Groups Management page, you will see an action bar at the top of the page, and a list of the groups you’ve created on the bottom of the page. Select the Createbutton in the action bar at the top of the page. Then, in the pop up box, assign a name and description to the group. Then, choose the policy for the group’s population process (either manual or automatic) and press Confirm. Let’s see the difference between these two options. When you create a group, you can Manually assign users to this group. 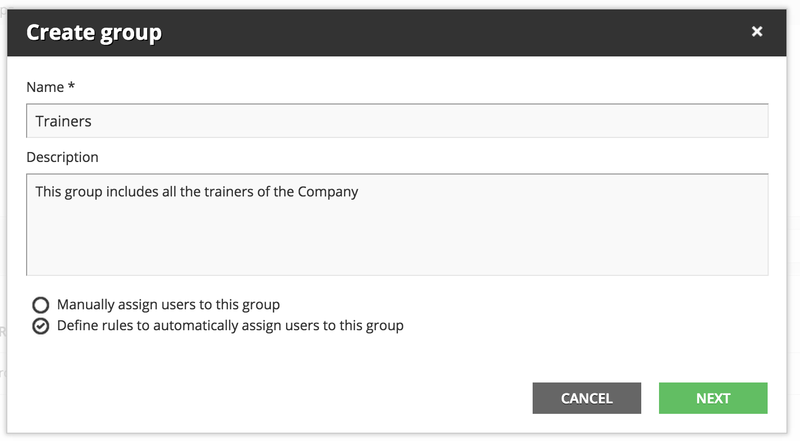 Using the menu icon for each group in the list of groups on the Groups Management page, you can associate assign each users to a group, change the name and description of the group, or delete the group. You’ll have to manually assign users to this group by selecting the related icon in the group’s row in the list of groups. So, select the Assign Users icon, then manually select the users by choosing them from the full user list, or from the groups and branches, then press Confirm. The system will then display the list of the assigned users. Please note that a user can be assigned to more that one group. You can also create subfolders in this area to further organize your group. 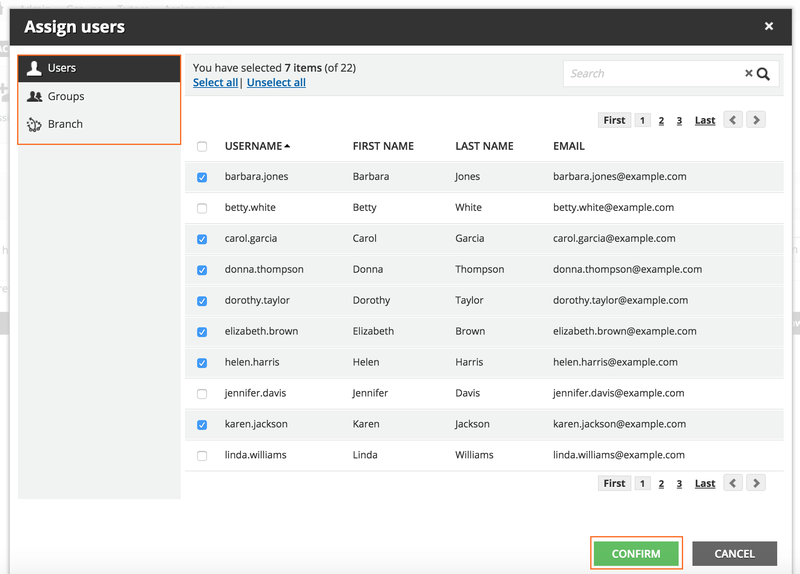 Users of a group can be edited, added, or deleted at anytime. 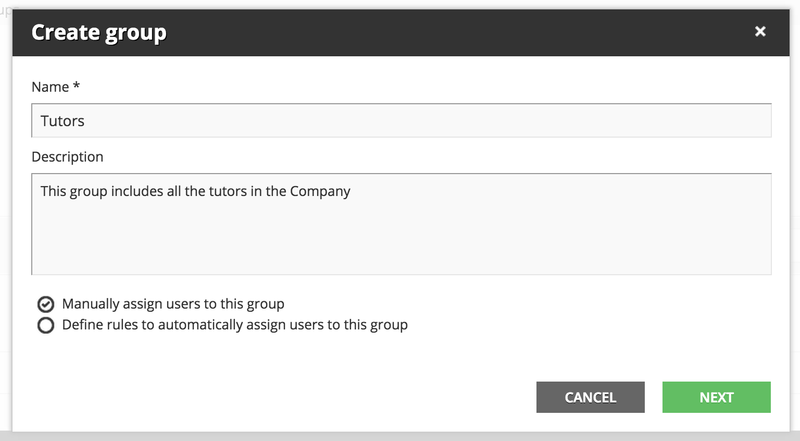 You can create groups and auto-populate them using the parameters in the additional fields. When you first create your group, flag the option to Define rules to automatically assign users to this group, then assign the name and description and press NEXT. Now, set the rules that will direct the population of the group. Select the additional fields that will be associated to this group from the dropdown menu, and insert the related values. This means that all of the users associated with this specific additional field value will be included in the group. You can use any kind of additional field type except the following: yes/no field, upload file field, or free text field. You can also combine different filters and different additional fields. Furthermore, you can decide if the rule must satisfy all of the conditions, or at least one. This operation can be retroactive. Simply mark the checkbox to Apply to existing users that satisfy the conditions above in order to include the existing users who match the new requirements. From then on, all of the new users associated with the specified additional fields will be included in this group.